Florida Tax Free Weekend has not been officially announced yet for 2019. 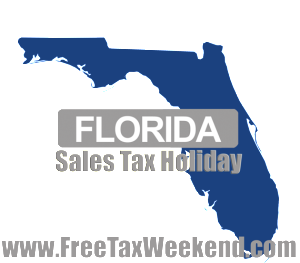 The Florida Sales Tax Holiday 2019 is coming and our unofficial dates are August 2nd through 4th, 2019. CLOTHING Up to $60 each. Florida legislators were a little more generous than years past. Garments and accessories are tax free up to $60 each. In 2013, the exemption stopped at $75 per piece. SHOES Up to $60 per pair. Shoes are eligible for the tax exemption. As with clothing, however, only footwear costing less than $60 per pair will ring up tax-free. 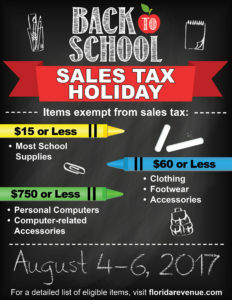 Sales tax will not be charged on items such as pens, pencils, erasers, rulers, and glue. The state set a price limit of $15 per item for this category, but left off items such as staplers and computer paper. All books, besides the Bible, are still taxable during the Florida Sales Tax Holiday 2019. Lawmakers love tourists, but they did not want to give visitors a tax break. So, sales tax will still apply to purchases made in theme parks, entertainment complexes, hotels, and airports. Sales tax should not be charged on eligible items that are ordered online — even if those items are delivered after the sales tax holiday ends. See Walmart Sales Tax Holiday for general online tax free policies. The state has no issue with you using coupons or taking advantage of buy-one-get-one-free sales during the sales tax holiday. Use this to your advantage and make the most of this great tax free savings event. Retailers are increasingly competitive in the back-to-school period, so be on the lookout for bargains that are unlikely to repeat themselves during the school year. * Florida’s House and Senate had the option to give us a full week of Florida tax-free back-to-school savings. But they decided against it. Tax Free Week 2019 Florida were all rumors.